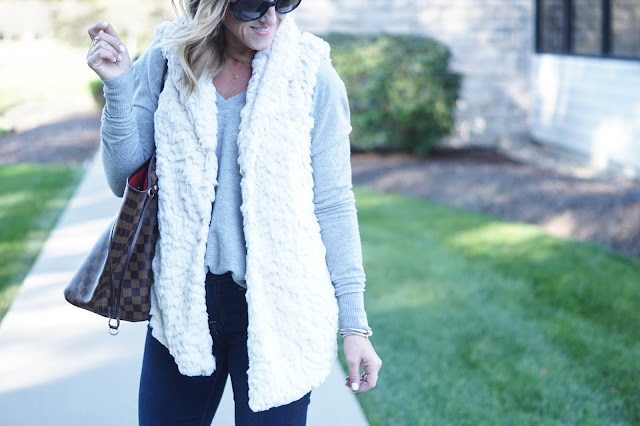 I've had my eye on this fur vest for 2 years! I know - that's crazy right? I'm so glad I finally decided to get it. Not only is it incredibly soft, but this creamy color will be beautiful through Winter. Good news is that it's now currently on sale! Earlier this week on our Instagram stories, I shared my latest shopping experience at Evereve at Easton Towne Center. If you are looking for a store near you, check here or you can shop them online here. They currently have a Fall Sale going on now through the 22, so check it out!! Evereve is one of my favorite stores to shop at online and in-store. They are known for their assortment of trendy and classic pieces that help any mom, or woman, feel comfortable and confident. I love that they have a variety of items from designers such as Free People and 7 For All Mankind to more affordable brands like Kut From the Kloth and Blank NYC. As a mom who typically has at least one child with me when I'm out shopping, I love when a store has something to offer the kids. Evereve is a favorite because not only do they have toys that my 5 year old loves to play with, but they have goldfish snacks to keep them all occupied. That's a win for everyone! I had been on the lookout for a new pair of jeans that had some type of unique detail. I wear jeans most days so I get "bored" with the same looking distressed jeans. When I tried on this ankle split skinny jean, I knew they were a winner. If you've followed us for a while, you know we are all about comfort. If an item is not soft, moveable and comfortable, it's not for us. These jeans have a classic skinny style with some stretch. I did go down 1 size. A big Thank You to Evereve for collaborating on this post! As always, all opinions are my own. What a cute outfit! I’ve loved those fur vests, but I’m afraid of looking like a yeti😬but this one is so cute! I love how you styled it too!! Happy Friday! Hehe! I completely understand! I tried on a jacket like this the other day and it was a little overwhelming. I prefer the vest!! Ha! Yes! Sometimes you have to make sure you'll actually get enough wear out of it. I've waited that long to purchase something too! That vest is so cute. I am really loving white for Fall/Winter! Thanks so much!! I think it will be really pretty styled for a Winter look.